to reflect the company's goals, spirit, and community. Not all pieces made the final cut, but here's a snap shot of some of the finer examples of this larger project. Magnetic "Community" wall, and "Values" wall - These office walls were featured near a majority of the staff. The magnetic wall featured custom typography, and four large "framed" areas that were treated with magnetic receptive materials. The idea was that office employees could post photos of family, company events, and news to the framed areas which would allow the wall to interactive and personal. The "Values" wall featured the same faux brick background as it was on a connected corner. A simple, bold treatment to company values greeted visitors. The Graffiti Wall - A super-custom idea on the part of the company, this breakroom wall featured over 20 tag names of long standing employees. I teamed up with another in-house artist, Barns Portillo. Having a lot on my plate, Barns created a majority of the over 20 tags. My style differed from Barns' which helped enhance the effect. All tags were sketches of some nature, requiring vectorization and correction. The tags were then colored by myself in various styles and interggrated into the wall. Breakroom Wall #2 - Faux chalk wall (a real chalk wall was an option). The company slogan "Design, Build, Maintain" featured prominently. Map Wall - Another "interactive" stand alone wall piece that featured photography related to each state represented, and an accurate map. Direct printed to .5" clear acrylic, this piece relied on various complex production methods including: stand-offs, custom router cut, and advanced white ink usage for graphic readability. 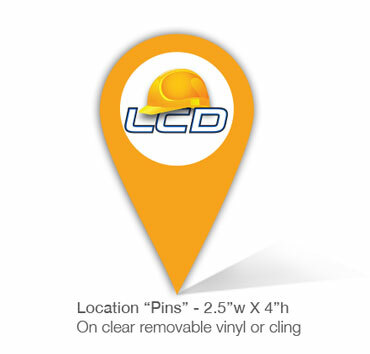 Location pins were held in the "Future Project" area. Designed to be placed in project area all over the map. Printing Room Stand-Offs - Three panels with custom graphics utilizing LCD's very own blueprints and photography. Direct printed to Sintra, and mounted to metal grating which was mounted to the wall. Creating a layered graphic, echoed by a layered mount. 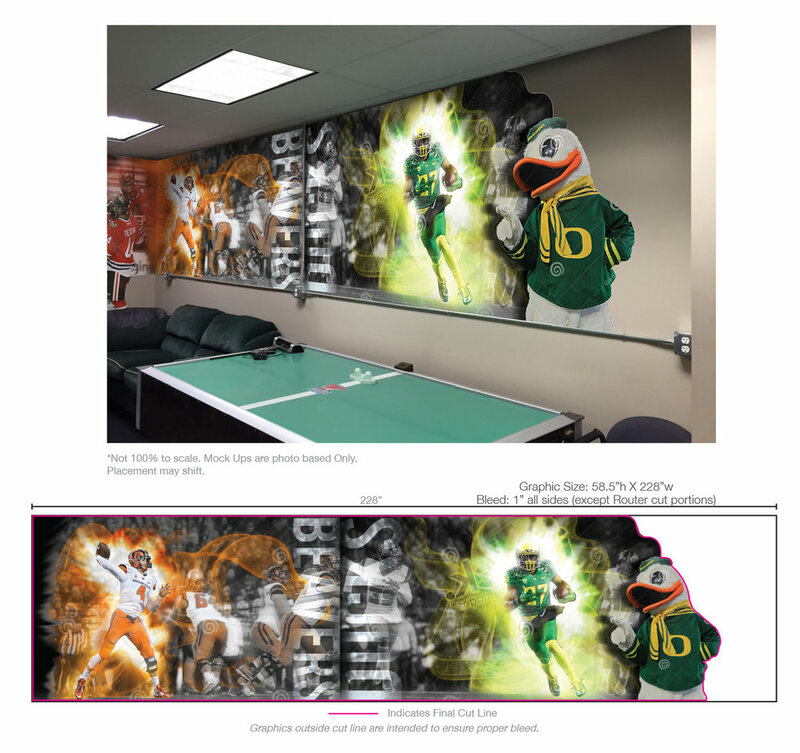 Civil War Wall - Large breakroom wall featuring Ducks and Beavers in action. Action shots, and the mascot photos were found via a local photographer. Also supplemented by stock graphics which tied into adjacent walls including the hockey wall on the left side. Graphics made use of the power outlet as a breakup point, also utilized a custom router cut to the right side. Unfortunately, this wall was physically remodeled, so final production files were not created, hence the placeholder images.